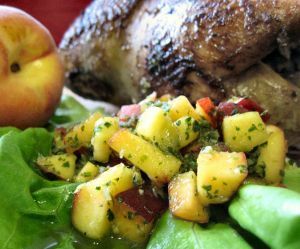 Fresh summer peaches provide the base for a refreshing salsa to accompany roasted, smoked or grilled poultry. This recipe has several flavor accents: ginger and green onions for heat, cilantro for freshness, honey and Meyer lemon juice for sweet-tart, nutmeg as an earthy component that is particularly nice with poultry. Whether the poultry is pheasant (pictured here), game hens, duck or chicken an over night brine will add both moisture and flavor. To a brine of salt, sugar and water add a few bay leaves and 12 crushed juniper berries. Remove the bird from the brine, pat dry and let sit or a rack in the refrigerator for several hours before cooking. This air-drying will help seal the skin and create an even browning. Salt and pepper the bird well before cooking as the sweet peaches will play off these seasonings. Wash the peaches, half and cut into ½”-inch dice. Set aside in a bowl. Chop finely and combine the remaining ingredients by hand or in a food processor. Gently stir together with the peaches and taste for salt and pepper. Salsa can be made several hours ahead and refrigerated. For full flavor serve the salsa at room temperature.